For the geographic definition for a place smaller than a village, see Hamlet (place). The Tragedy of Hamlet, Prince of Denmark is a play by William Shakespeare. It is one of his best-known plays, and many lines have become famous quotations. The play is often just called Hamlet. Hamlet was written between 1600 and 1602, and first printed in 1603. 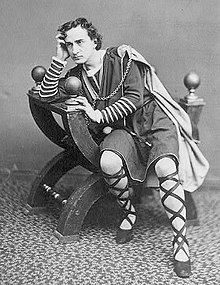 Hamlet is a young prince in Denmark who was supposed to become king when his father (also named Hamlet) died. Instead, the throne was seized by Hamlet's uncle Claudius, who also married Hamlet's mother, Gertrude. Hamlet meets a ghost of his dead father, who tells him that he was poisoned by Claudius and demands that Hamlet kill Claudius in revenge. Hamlet is at first not sure whether to believe the ghost, so he tries to investigate. He pretends to be mad to hide what he is doing. As the play goes on, it becomes hard to tell if Hamlet is actually mad or still just pretending. His behaviour causes him to fall out with Ophelia, a girl he was in love with. He eventually has the idea of getting some actors to put on a play of a king being killed in the way the ghost described. Claudius panics when he sees the play, and Hamlet realises his uncle is a murderer. Hamlet has a chance to kill Claudius in the castle chapel, but cannot bring himself to do it. While waiting outside, he gets into an argument with his mother. Someone moves behind a curtain and Hamlet, thinking it is Claudius, stabs him. It turns out that he has killed Polonius, a royal advisor and Ophelia's father. Claudius orders Hamlet to be exiled to England. He sets up a plot to have Hamlet killed, but Hamlet escapes and returns to Denmark. Meanwhile, Ophelia has been suffering from madness after falling out with Hamlet. After learning that he has killed her father, she drowns herself. Hamlet reappears at Ophelia's funeral and gets into a fight with her brother Laertes. Laertes blames Hamlet for his sister and father's deaths and wants to take revenge. He challenges Hamlet to a swordfight. Hamlet agrees. The swordfight is arranged to take place at the castle. To get Hamlet killed, Claudius gets Laertes to fight with a sword that has poison on the blade, and brings some poisoned wine in case this does not work. The swordfight begins. After some fighting, Laertes wounds Hamlet and poisons him. During a break, the swords are mixed up and Hamlet ends up fighting and wounding Laertes with the poisoned sword. Laertes shows regret for what he has done and tells Hamlet about the poison as he dies. Meanwhile, Gertrude drinks the poisoned wine by mistake and dies. Realising that he is also dying, Hamlet stabs Claudius with the poisoned sword and forces him to drink the rest of the wine. In his last moments, Hamlet tells his friend Horatio that Fortinbras, a Norwegian prince, should be named as the next King of Denmark. Hamlet is one of the hardest parts for an actor to perform. It is one of the largest roles written by Shakespeare. Many people disagree about what Hamlet is really thinking. For many actors, playing Hamlet is one of the most important parts of their career. 1948 Hamlet played by Laurence Olivier. Directed by Laurence Olivier. 1960 A version made for German television. This version was later an episode of Mystery Science Theatre 3000. 1990 Hamlet played by Mel Gibson. Directed by Franco Zeffirelli. 1996 Hamlet played by Kenneth Branagh. Directed by Kenneth Branagh. A movie of the entire play. 2009 Hamlet played by David Tennant. Directed by Gregory Doran, a three and a half hour Television adaptation for the BBC. An adaptation of the folio text with changes from the first and later quarto's to fit the dramatisation. 2014 Bollywood movie "Haider" directed by Vishal Bhardwaj, where role of Hamlet played by Shahid Kapoor. This page was last changed on 9 October 2018, at 10:44.